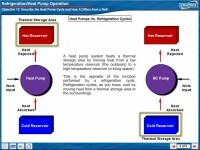 Amatrol’s Thermal Technology 1 Learning System (96-TT1) provides learners with the knowledge and equipment needed to comprehend the principles of modern thermal systems, such as HVAC, geothermal, refrigeration, and steam systems. As learners progress through the curriculum, they will perform experiments demonstrating principles such as the ideal gas law, linear and volumetric thermal expansion, basic temperature measurement, latent and sensible heat, specific heat capacity, conduction, convention, radiation, evaporative cooling, and basic refrigeration. This tabletop learning system showcases a full range of components, such as a fi re syringe, a vacuum hand pump, bi-metallic ball and ring, and many more on a vertical panel for easy access and inventory. 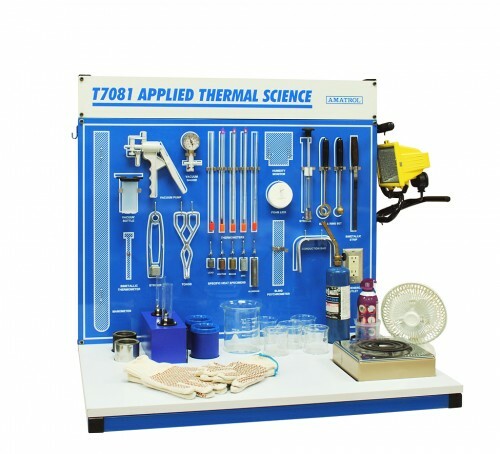 These components are used in various combinations to conduct experiments that show learners physical examples of thermal concepts and build foundational knowledge that they can use in real-world applications! The best way to engage learners and reinforce theoretical concepts is to apply the concept using hands-on skills. For example, using a vacuum pump supplied with the 96-TT2, learners lower the pressure on a container of warm water until it boils, which demonstrates the relationship between pressure and a fluid’s boiling point. As learners study thermal expansion, a key concept in bimetallic thermostats, they will apply heat to a bimetallic strip and observe how different metals expand at different rates. These and many other experiments engage the learner and build a solid foundation for further study in the field of thermal systems.